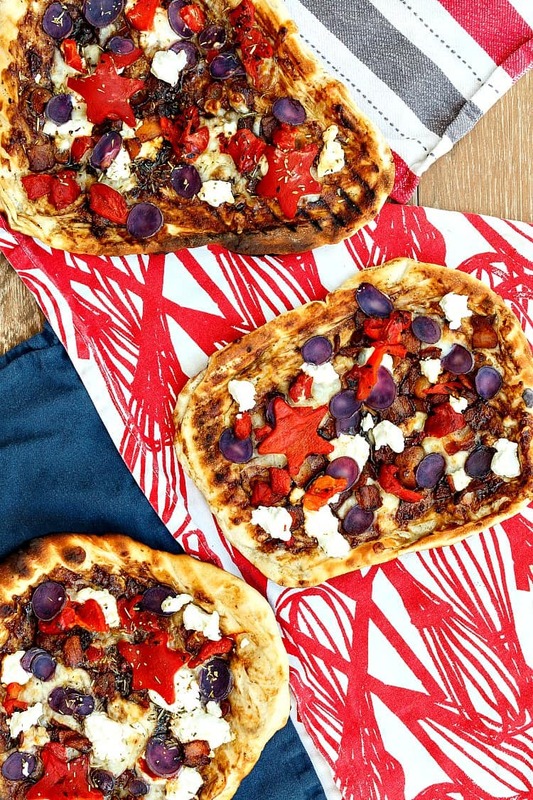 Grilled pizza gets a patriotic makeover with blue potatoes, goat cheese, and roasted red peppers. Cut some of the peppers into stars and enjoy grilling out this Memorial Day. 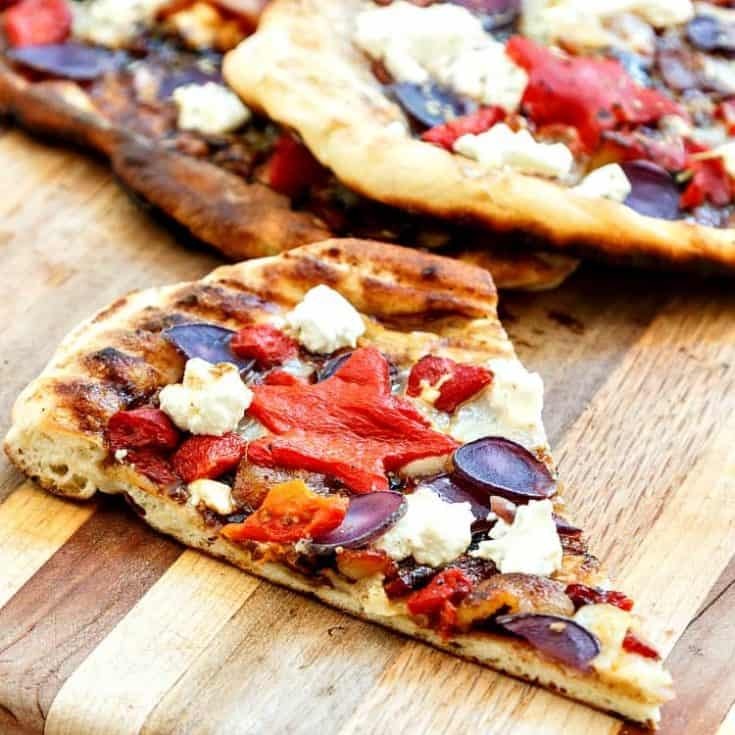 If you are interested in celebrating Independence Day (or Memorial Day) with food that is red, white, and blue, but you’re not a fan of food dye, this grilled patriotic pizza will be right up your alley. Do check out all the deliciousness we’ve made for you for Progressive Eats. Everything sounds fantastic, as usual! Full disclosure, this is the first time I have ever grilled pizza, and I think it went quite well. For a first time. I do suggest that, unless you have a (affiliate) gas grill with special zones, put all the coals on one side and grill your pizzas on the other. This prevents Black Bottom Syndrome (what? It’s a thing.) as well as Cursing. Once I moved the coals over to one side, things went much more smoothly. And the pizza was fantastic, so there’s that. Worth just a bit of cursing, I think. 2 So, What’s On That Guy? The nice thing about grilling pizza is that, since it goes very quickly, you have to have all of your toppings ready to go. For me, that meant I prepped all my ingredients earlier in the day and grilled a few hours later. Once it’s time to grill, each pizza gets a quick grill on one side, then you flip, add the toppings quickly, and put the lid on the grill for 4-5 minutes to cook your pizza through. Since I’m new to grilled pizza, I used long-handled tongs to move mine a quarter turn every minute or so to keep the side nearest the coals from getting too brown (or black). Total cooking time per pizza? About 6-7 minutes. Nice! So, What’s On That Guy? Aside from the obvious patriotic toppings–roasted red pepper (I just bought the kind in a jar and used a cookie cutter to cut a few into star shapes), blue potatoes, and white goat cheese–I added some par-cooked bacon. You could absolutely leave it off, but it does add a nice salty-savory note. I also scattered on just a bit of freshly grated mozzarella, because I like stretchy cheese. Maybe my favorite topping, though, is the “sauce” I made. I had some Balsamic Sweet Onion Jam that I bought at the Bruce Julian store, and the lovely folks from Valley Fig Growers sent me some of their fig jam. I chose their Balsamic Pepper version for the pizza. I just mixed the two jams 50/50, added some olive oil, balsamic, salt, and pepper, and voila: a sweet-savory pizza sauce. Before we get to the Grilled Patriotic Pizza, let me show you what everyone else has made for our Red, White, and Blue Independence Day celebration for Progressive Eats. Welcome to Progressive Eats, our virtual version of a Progressive Dinner Party. Our menu this month features a cocktail and dishes perfect for your 4th of July bash! We’ve got a great mix from appetizer to desserts; and yes, we have multiple desserts perfect for this summer holiday! Hosting this month is Barb from Creative Culinary. 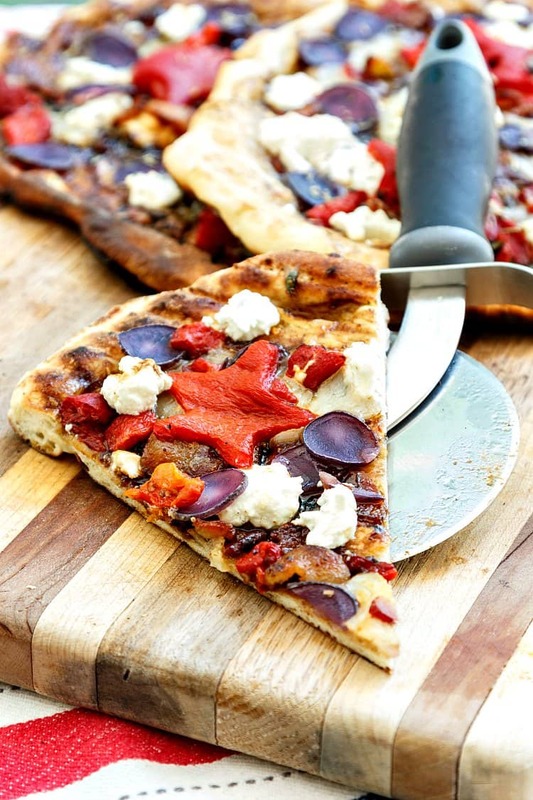 Ready to make grilled pizza with roasted red peppers, blue potatoes, and goat cheese? Of course you are. Let’s get started. Remember, it’s better if you get all your ingredients prepped so you can build your pizza once it’s on the grill. I cannot stress this enough–learn from my mistakes! If using a charcoal grill, grill over indirect heat. That is, build the fire/pile the coals on one side of the grill and cool over the other side. Otherwise, you will end up with a burnt bottom crust, and that is no fun. If you like the sound of this recipe, please rate and comment! And if you make it, and I hope you do, I’d love to see a photo. Tag me on Instagram at @onlinepastrychef and use hashtag #pcorecipe! Now let’s get to grillin’! This grilled pizza celebrates Independence Day with the red of roasted peppers, white of creamy goat cheese, and blue of blue potatoes. Oh, and bacon. Enjoy! Brush the less attractive side of each round with olive oil. Set up a two-zone grilling situation. You'll be grilling on the cooler side. 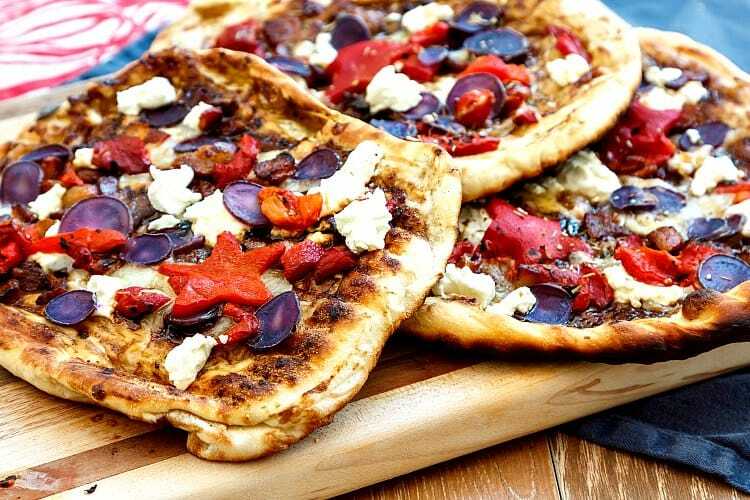 Flip the dough over and brush on some of the fig balsamic sauce. Put the lid on the grill and let the pizza cook 4-5 minutes, turning the pizza 90 degrees every minute or so to help it cook evenly. There may be a better way to do this, but I'm telling you how I did it. If you are a pro at grilling pizza, please do what has worked for you in the past. *I used the pizza dough recipe from Revolutionary Pizza, which magically makes alomst exactly 24 oz of dough. You can find the recipe here. Note: the dough does not need any help getting charred spots on the hot grill, so leave out the sugar. And that’s it, friends. Thanks so much for spending some time with me and the Progressive Eats bloggers! Take care, enjoy the grilled patriotic pizza, and have a lovely day. That is the cutest looking pizza I ever saw. So colorful and so unique! Let’s go for a picnic Jenny! I adore this idea for a patriotic pizza and know everyone will be diving in head first to grab the first slice! Another winner Miss Jenni! Thanks, Jane! Good stuff! Getting ready to dive into everyone else’s posts, too. Can’t wait! Bill is an expert at the black bottom grilling syndrome—especially when it come to pizza. I’ve finally convinced him that a gas grill has its purpose and I can’t wait to try your fun, festive pizza once we get one! I really should practice more, but I like to live on the edge! lol I love our menu for this month–so great!